To accompany the big meal, toss together a salad full of depth and character to pass around the table for guests to enjoy. Use dark leafy greens like kale and spinach and add in seasonal fuit and like apples, pears, and cranberries along with nuts such as walnuts and pecans to get that disctinctive fall flavor and great crunch out of this salad. A great salad can compliment any meal, especially a Thanksgiving feast, so be prepared with a fantastic fall salad fit for the occasion. Crunchy, creamy, tangy slaws aren't just for summer; they add a welcome contrast to the heartier dishes of fall--and free up much-needed oven space on Turkey Day. 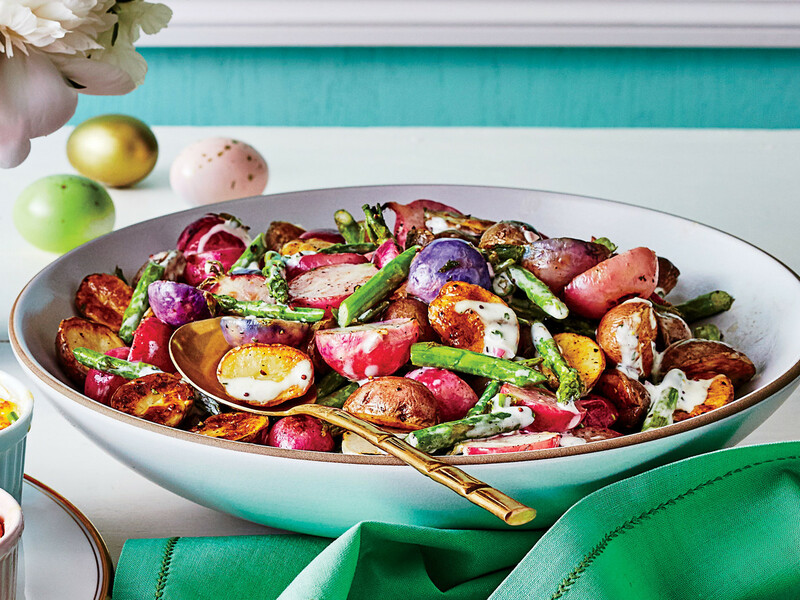 A big, colorful salad is a welcome sight at Thanksgiving. The rich cheese and ginger-apple cider dressing unites the fruit with the greens. Anchovy paste is the secret ingredient for savory depth in this salad. Fresh, crunchy, herby, juicy—this salad gets high marks for hitting all kinds of pleasure points. Tossing the endive leaves in the vinaigrette first softens their bitter edge. You could also sub thinly sliced fennel or chopped Romaine hearts. This simple, refreshing combo will never go out of style. Soaking the sliced red onion in cold water mellows its pungent bite. 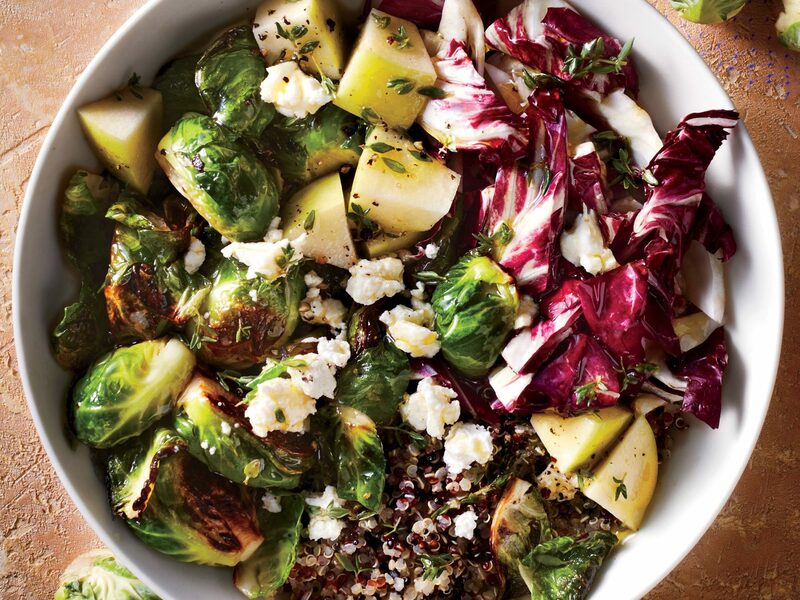 This hearty salad is brimming with the flavors of fall with ingredients such as pumpkin seeds, brussels sprouts, cranberries, and dark, leafy greens. The classic delight of sweet apples and extra-sharp white cheddar cheese meet in Kale Salad with Apple and Cheddar to give the vitamin-enriched green an extra boost of flavor. Bosc pears, Granny Smith apples, and dried pecans are tossed together with romaine and baby arugula for seasonal Harvest Salad. Sauerkraut meets coleslaw in this vinegar-based salad. Paper-thin apple slices and finely shredded cabbage add rich autumn color. Had it with ho-hum greens? Try this intoxicating mix of watercress, fennel, and fresh citrus. Use crumbled goat cheese in place of Stilton, if you prefer a milder flavored cheese. This Roasted Pear Salad comes together in just 20 minutes and is topped with spiced pecans, blue cheese, and a sweet, homemade dressing. Looking for a new salad idea? Try this easy pear and goat cheese salad topped with toasted almonds and your favorite raspberry vinaigrette dressing. This simple winter salad gets plenty of fresh crunch from a mix of radishes, and pungent richness from blue cheese. It's good without the apple too. For a truly delicious saiad full of fresh autumn flavor, try topping your greens with roasted squash and beautifully tangy and sweet maple vinaigrette. Time: 20 minutes. A mix of chartreuse and bronze lettuces--if you can find them--really sets off the fruits' fall colors. Crisp pancetta and juicy pears make this salad special enough to be holiday-worthy. Prep and Cook Time: 20 minutes. Buttery squash, crunchy pumpkin seeds, and smoky bacon make this a fall salad you'll want to enjoy often. Serve with pork chops. If savory and sweet is your favorite flavor combination, then this salad topped with dates and bits of bacon will be your ultimate salad combo. Use sliced apples to provide even more texture and fresh arugula to offset the sweetness. 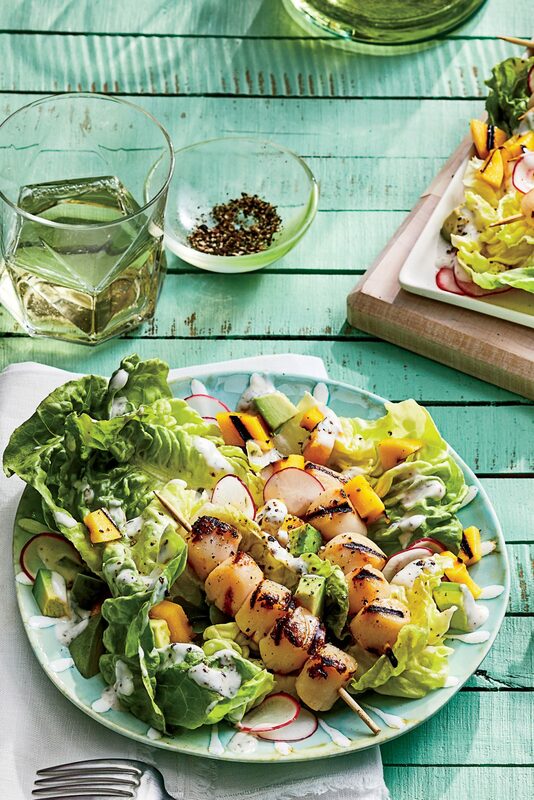 Sparkling cider and cider vinegar amplify the apple flavor in this fresh seasonal salad.